The GT300L Guide Light Wall Tap from CyberPower expands one grounded outlet into three grounded outlets and features an automatic light-sensing LED for ease of use in the dark. The Guide Light Wall Tap has a row of three standard spaced outlets for convenient arrangement of plugs. 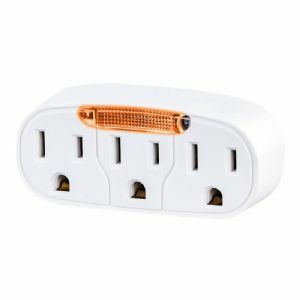 CyberPower wall taps come in a variety of designs for providing additional outlets. Grounded Three-Prong Outlet Expands one grounded outlet into three grounded outlets. LED Guide Light Automatic LED guide light for easy viewing in dim or dark conditions.